If you are looking for a premium riflescope with 25-26X max magnification, there are two impressive new options, and both come from Europe. Swarovski just announced its new X5 5-25x56mm scope while Leica has unveiled the new ER 6.5-26x56mm LRS. Intended for long-range shooting, both these scopes offer razor-sharp glass and some advanced features. The Swaro offers 20 MOA per revolution, plus a unique “Sub-zero” capability. The Leica has some interesting reticles and an attractive price. * This is at 100m for the Euro version with 0.5cm click values (1/6 MOA). Leica has not published MOA elevation. 120 cm at 100m works out to about 41 MOA at 100 yards. ** Based on €1990.00 (Euros) stated price. The actual price, as sold in the USA, could be higher. Swarovski recently unveiled its new X5 series of second focal plane scopes for long-range shooting. There will be two models, a 3-18x50mm and a 5-25x56mm. Both are available in standard and illuminated versions, the latter designated as X5(i). Long-range reticles with be available with either 1 MOA or 2 MOA stadia hash-marks. The 5-25X model offers either 1/4-MOA or 1/8-MOA clicks. The 5-25x56mm X5 has a lot of elevation travel — 82 MOA. And this is a rugged scope — the elevation, windage, and parallax turrets, as well as the inversion system are built with stainless steel components. This enhances component longevity and durability. The Swarovski X5 scopes boast a new “Subzero” Function. This innovative feature allows the shooter to instantly come down 10 MOA (40 clicks) from a pre-set zero. That’s a nice option for training, letting you quickly switch from near to far. The new X5(i) Rifle Scope will be available in two different models, X5(i) 3.5-18×50 and X5(i) 5-25×56, in Fall 2015. For more information, visit Swarovskioptik.com. With 26X magnification on tap, the ER 6.5-26x56mm LRS riflescope is suitable for long-range hunting as well as many target disciplines. The new Leica ER 6.5-26×56 LRS offers ultra-sharp glass with low color fringe (chromatic aberration). This is a big advantage when viewing high-contrast subjects such as black-on-white targets. Eye relief is ample, and the scope offers a -4 to +3 Diopter compensation. Three reticle options are offered including two Ballistic reticles with elevation lines and horizontal (windage) hash marks. With a rugged, aluminum “mono-body” main tube, the Leica is waterproof and fog-proof. Like all of Leica’s ER riflescopes, the ER 6.5-26x50mm LRS features a high-tech glass coating process technology. The scope is bright, with 91% light transmission. The HD glass elements are precision-ground with a state-of-the-art laser-guided production process. The new Leica ER 6.5-25x56mm is priced competitively. At the IWA show in Germany this month, Leica said the scope should retail for about 1990.00 Euros, which works out to $2089.00 U.S. Dollars at current exchange rates. 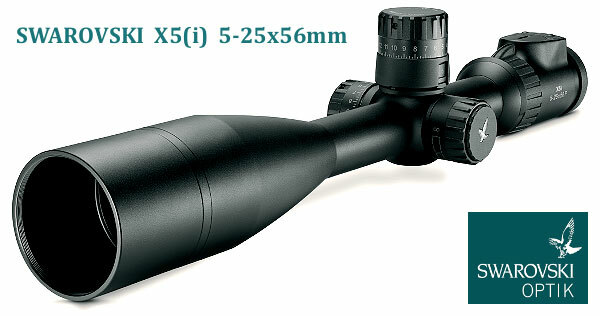 Even if the “as imported” price goes up for the U.S. Market, that makes the scope much less expensive than Swarovski’s X5 5-25x56mm scope, and less than some comparable US-made optics. 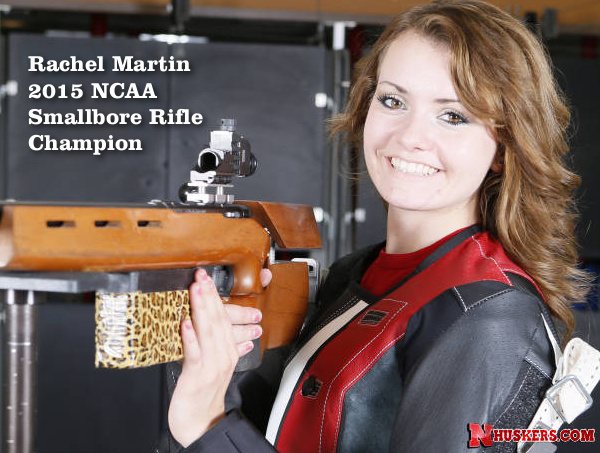 Share the post "New Long-Range Scopes from Swarovski and Leica"
Congratulations to the University of Nebraska’s Rachel Martin, the new 2015 NCAA Smallbore Rifle Individual Champion! Competing at an indoor range in Alaska, Rachel fired a Final score of 453.3 to edge runner-up Ryan Anderson of the Univ. of Alaska Fairbanks (452.6). The NCAA Championship Air Rifle matches will be held this weekend. You can view Live target images and results on the CMP Match Results Webpage. 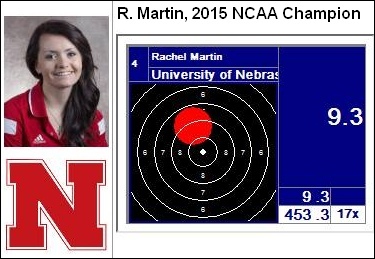 In an interview with NRABlog.com, Rachel gave credit to her Cornhusker team-mates for helping her secure the championship. NRA Blog: Rachel Martin never wanted to learn how to shoot. But thanks to a little prodding from dad, she eventually found a passion for the sport. A passion that brought her the 2015 NCAA National Smallbore Rifle Championship. “It’s a little overwhelming right now,” she said after winning the title. Emerging from a crop of 48 shooters…this Nebraska sophomore blazed through the opening rounds to earn a spot in the coveted final round. It was there that she held steady until making her move for the win. 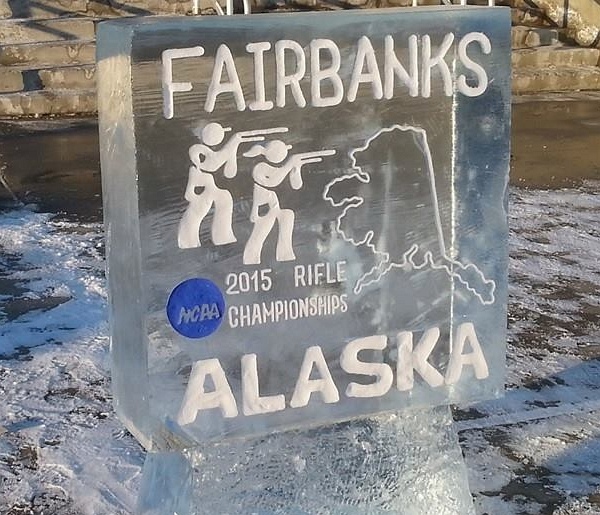 In Team competition, the University of Alaska Nanooks won the 2015 smallbore rifle team championship. West Virginia University (WVU) finished second and University of Nebraska placed third. Full team results can be downloaded via this link. Currently, in Saturday’s Team Air Rifle Competition, the “home team” Nanooks are leading by a narrow 3-point margin over the WVU Mountaineers. 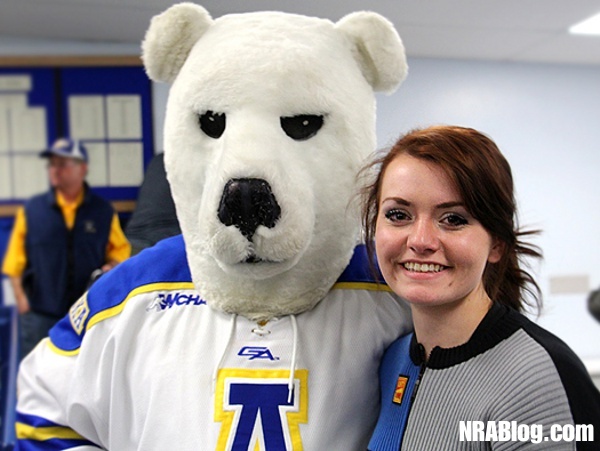 Rachel Martin poses with Nanook, University of Alaska’s mascot, at 2015 NCAA Rifle Championships. Yes it was cold in Fairbanks. A member of the Jacksonville State University (JSU) rifle team snapped this image on Thursday. The caption said it all: “It’s just easier to make a sign out of ice than paper here I guess. It was -35° F when we got to the range this morning! Share the post "Univ. of Nebraska Co-Ed Wins NCAA Smallbore Championship"
ThoseShirts.com offers a selection of T-shirts with pro-gun rights messages. 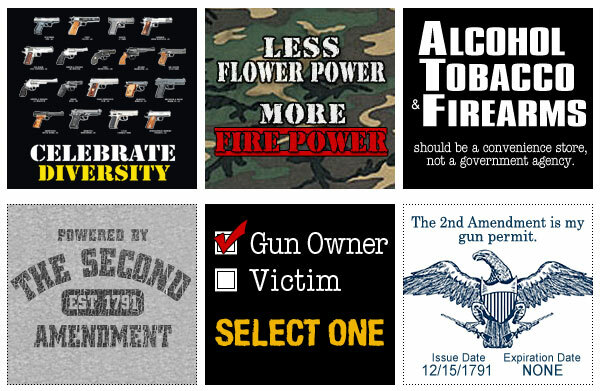 Priced at $19.95, these shirts allow you to show your support for the Second Amendment. The shirts’ themes range from serious (“The Bill of Rights is not negotiable”), to sarcastic (“Less Flower Power… More Firepower”). Below are some of the more popular designs printed on the back of the 100% preshrunk heavyweight cotton shirts (some designs are front + back). Share the post "Worn with Pride — T-Shirts with Pro-2d Amendment Messages"